Strabismus is an eye problem where 6 muscles around the eyes cannot work in a proper way in conjugation with each other. This means that both eyes of a child or an adult cannot look at any object at the same time. Some people refer to this eye condition as “cross eyes’, because one eye looks in a totally different direction than the other. This eye condition may result in the formation of two entirely different images, which may confuse the brain and it may start ignoring one of the images as it may believe it is incorrect. They eye that brain thinks is transmitting incorrect image may suffer from an eye condition called “lazy eye (amblyopia). Strabismus is mostly seen in kids, and past studies have shown that more than 64 percent cases are in infants shortly after birth and they can be easily sported. Number of health conditions are associated with strabismus, including serious brain injury, diabetes, and cerebral palsy. In cases any family has some history of strabismus, then there are chances that kids born in this family may suffer from this condition. Also, it is possible that one who is suffering from strabismus may also suffer from other eye problems such as loss of some vision, or double vision. 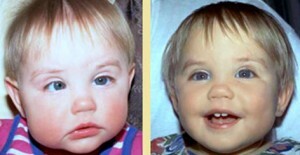 Strabismus symptoms may appear or disappear with time, and most prominent during ill health or any other sickness. Once you are diagnosed with this condition, you should go for detailed examination of your eyes to ascertain which of your eyes is misaligned. In this examination, both your eyes will be tested for acuity and light reflex. Standard ophthalmic examination will also be carried out before any treatment is recommended. In mild cases, spectacles may be recommended and doctor may also suggest placement of patch over lazy eye. This forces the weak eye to increase its performance by working harder. If non-surgical treatment is not successful then eye surgeon may opt for best strabismus surgery in children and adults. It may or may not improve sight problem, but it will definitely make both eyes move in unison. When surgery is combined with spectacles, you can get good results within a short time, particularly when this treatment is performed at a young age. It is also possible to strengthen eye muscles using series of eye exercises, but one can get best results only through strabismus surgery. If this eye condition is allowed to linger for long, there can be substantial loss of vision. Therefore, if you or your child is suffering from this condition, you should go for an early diagnosis and treatment. This entry was posted in Medicine and tagged eye problem, eye problem treatment on April 15, 2013 by Mommy Yam.